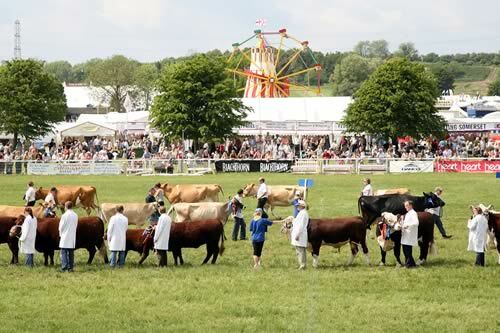 Historically, all the major livestock championships were contested on the Thursday and Friday of the Bath & West show – but now the classes have been extended to provide top competition throughout Saturday as well. “Our dairy exhibitors find it easier to source relief farm staff towards the end of the week, and weekend visitors are just as keen to see the best livestock as those who come mid-week,” says show organiser Alan Lyons. As well as getting up close to some of the best livestock in the South West, visitors to the show will be able to taste award-winning farm produce in the cheese village and cider tent. “We’re delighted that the prestigious British Cheese Awards will be making their new home at the Royal Bath and West Show in 2014,” says Mr Lyons. A new equine marquee and gardening area are among other new additions to the show, which will also feature the thrilling Devil’s Horsemen Stunt Team and the Squibbfreestyle Motocross Stunt Show in the main ring. The Royal Bath & West of England Society was founded in 1777 in Bath by a group of philanthropists led by Edmund Rack. The Society was formed with the aims of encouraging agriculture, arts, manufacture and commerce. As the Society approaches its 236th year it continues to deliver a wonderful mix of established traditional exhibits through to the latest energy technology and contemporary entertainment.